Peter Whelan and Ensemble Marsyas recently gave the first modern performance of a birthday ode, The Applause of Mount Parnassus, by Johann Sigismund Cousser (1660-1727). Peter says "The sung text (published separately) was long known to exist, but the musical score was only recently discovered in the Bodleian Library in Oxford. 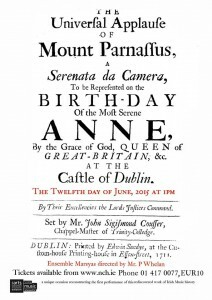 It is a ‘Serenata da Camera’ or short chamber opera, written for the birthday celebrations of Queen Anne at Dublin Castle in 1711.” The performance of the newly-recovered work was supported by the Arts Council.